Elizabeth in Vanity Fair & Total Film! 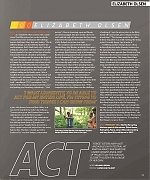 Elizabeth is featured in the October 2011 issue of Vanity Fair and the September 2011 issue of Total Film! Check out the scans!